You may hear that solid wood is better than veneers...or vice versa. In fact, solid wood and veneers are both good things. And both are widely used in the construction of quality wood furniture today. Solid woods are durable but can be more expensive. Veneers when constructed with quality methods can offer beauty and longevity. Check out this article for more detail on veneers. Consumers often confuse laminates with veneers, and they are two VERY different products. Veneers are real wood, cut from an actual log and wood species. Synthetic laminates are photographs printed on paper or synthetic material, to simulate the look of wood. Because they are inexpensive, laminates tend to be used on inferior quality furniture. Hardwoods are harvested from deciduous trees (those that lose their leaves in the winter) like oak, maple, mahogany, walnut, cherry, etc. It tends to be dense and heavy, sturdy and long lasting. Softwoods come from coniferous trees (those with needles and bear cones) like pine, fir and cedar. These tend to be a bit lighter weight as the wood is less dense, and can ding, mar or dent more easily. Much of today’s quality casegoods are a combination of solid wood (providing strength to frames, legs and other supporting components) and veneers. For instance, dining rooms will incorporate solid wood legs for support with veneers on table tops. Bedroom sets will use solids in the frames and areas where structural integrity is needed most and veneers in the tops, sides and drawer facings. Casegoods with drawer components such as nightstands, dressers, wardrobes and media units will typically be constructed using MDF (Medium Density Fiberboard) for top and side panels, and solid wood frames for construction strength. MDF that is used for top and side panels has a very flat, strong surface due to its high density. This allows for proper adhering of the veneer. Backings will then be attached using plywood or pressboard sheeting affixed to the frame using wood screws. This allows for accessibility into the piece if there is a need to repair the drawer track, or any other components that require servicing. Check frames for solid construction, look to see that the frame is reinforced with corner blocks to keep it strong and stable for years to come. English Dovetail - English dovetailing would be described as a “locking joint.” The taper of the male dovetail (on the drawer side) is turned opposite to the direction in which the drawer is pulled open. They will then be locked in a tongue and groove fashion and glued. With a tightly machined joint and the proper glue, this joint will last for generations. French Dovetail - French dovetailing is also a very strong locking joint, but it is machined a little differently from the English dovetail. It is machined so that the drawer side slides upward into a long groove in the drawer front. These joints are commonly used on top drawers and special case designs, like curved drawer fronts. Because of the height limitation of the French dovetail, these drawers will not be as deep as an English dovetail constructed drawer. Additional drawer construction features include corner blocks that are glued and nailed to support the drawer base. These help keep the drawer structurally solid over time. The next key component in case good construction is the drawer guide system. In addition to allowing drawers to move in and out, slides also prevent them from tipping downward when they’re pulled out past the halfway point. 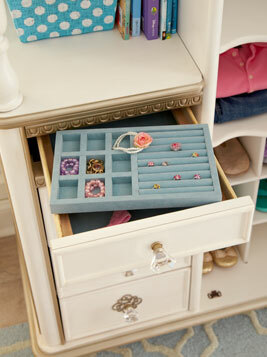 Drawer guides also feature guide stops that prevent the drawer from pulling out of the case piece by accident. Slides are typically configured and mounted either underneath the drawer or on its sides. Each style offers different advantages. Side Mounted Ball Bearing Guide - Side on side center mounted metal drawer guides offer superior weight tolerance as well as a smooth pull action. They are mounted on the sides of the drawer around the center of the board. This allows for equal weight distribution from front to back. Ball bearings are used inside the guide track and deliver a seamless gliding action. 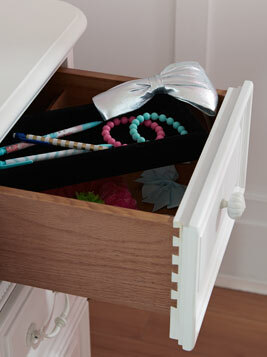 These will typically be used on larger drawers, due to the extra weight capacity they can hold. Center Mounted Wood Guide - Center mounted wood drawer guides offer equal weight distribution and balance the drawer so that it does not tip. The guide will run the entire length of the drawer itself, and is usually made from kiln dried hardwood that is waxed to provide a smooth pull. An additional benefit of a center mount guide is that it allows drawers to be used in smaller areas than other forms of guides will allow. Center Mounted Metal Guide - Center mounted metal guides offer equal weight distribution across the drawer and provide excellent balance. The guide runs the entire length of the drawer and provides a smooth pull to the action with little drag. The metal guide is also easily replaced or serviced if ever needed.